On the Internet there is a lot great and full of content blogs about blogging and making money online. But most of them are concerning not on the readers and their needs, but on the blogger, his or her problem(s) and affiliate links. Below there is a list of 5 most powerful blogs about blogging (of course in my opinion). Their authors are successful bloggers, because they respect their readers and reader’s time. 1) The Smart Passive Income Blog – it’s blog about „blogging”, passive income and making money from it. Inside this blog there is a lot of amazing tips and tutorials – some of them are really brilliant. Pat loves videos – on this site you can find a lot of “How to” and tutorials in video version. He also runs The Smart Passive Income Podcast. 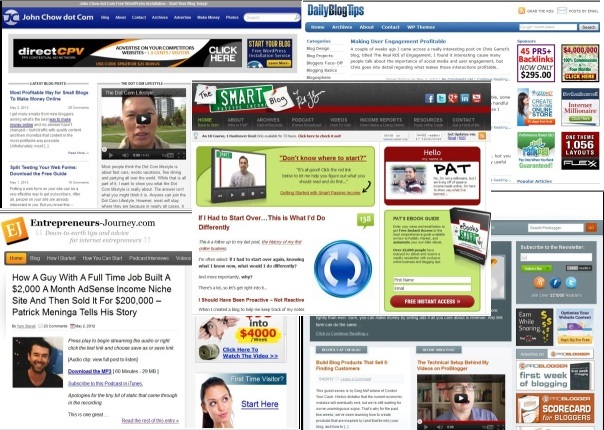 One of the most important series for Pat’s readers are his monthly reports about his incomes, in which Pat is trying to show, how he make money online, which tools he is using and “lessons learned” from previous month(s). 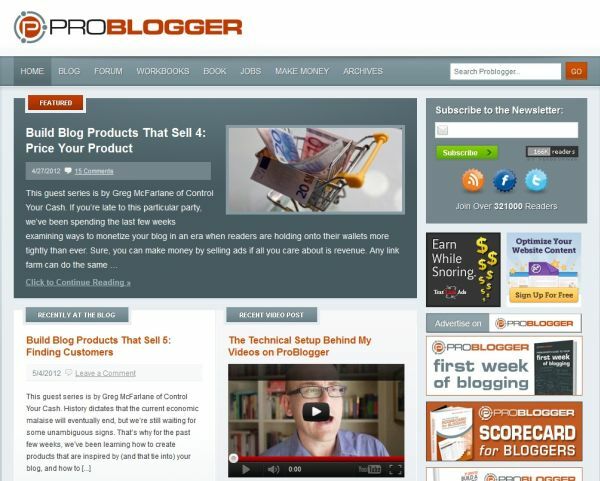 2) ProBlogger – it’s the most famous blog about making money online. Darren Rowse, who is the owner of this blog, is a full time blogger, and owns some other blogs – TwiTip (blog about tweeting) and Digital Photography School, where he “teach” people how to properly use digital camera. But concerning on ProBlogger – on this blog you can find thousands of helpful posts about blogging. And they are not only about making money online, but also about motivation, blog design or even Search Engine Optimization. Darren is also an author of some books and ebooks, which you can buy via his blog. 3) Daily Blog Tips is another great blog about blogging. Daniel Scocco, who is the holder of this blog, is also an author of the most posts on DBT. Even Guest Authors are following this “tutorial way” on Daniel’s blog. If you sign up to his newsletter, you’ll be able to download his great eBook “Make Money Online”, which I highly recommend to you. But you can still download his excellent eBook– “Ultimate Blog Profit Model” – you must only sign up to newsletter. In John’s newsletter you can also find great content with tips and tricks about blogging. One thing, which I don’t like in his newsletter, recently is that: there is (IMHO) too much advertisement and affiliate links inside. Of course some recommended products are really great and powerful for online money makers. Summarizing – I really recommend you this blog – especially older articles and John’s eBook. Yaro Starak, blogger and entrepreneur from Brisbane, is an author of this site. On this blog you can find, except lot of tips and tutorials about blogging, a lot of other topics about business, personal development and internet marketing. Besides, Yaro placed here a lot of interviews and podcast with successful online entrepreneurs. If you want to get “Step-By-Step Guide to Set Up A Profitable Website”, “The Blog Profits Blueprint” and “The Membership Site Masterplan” – you must only sign up on his page and you will get it all for free. And these eBooks are really valuable. And what are your favorite blogs about blogging or making money online? In some weeks I’ll share with you another blogs, which are listed by me. Trung, thanks for your comment! Great list Chris! These are some of my favorite blogs online too. I’ve learnt a lot from these and they continue to inspire me to grow my site in a similar way to these. Hi Matt, I totally agree with you – they inspire and motivate me to. Wow ! I follow some of them, thanks for the list, they help in blogging a lot. Very cool list. Didn’t know about John Chow – but now I do! I already follow the other ones to help keep me motivated and rejuvenated when I’m feeling down! share with you another blogs, which are listed by me. Wow, what a list. Treat to be reading that. Someday, we all aspire to be as big as these guys are! For personal reasons, my fav is Darren Rowse. Most of the one are those which I always follow and this is great infact! Thanks for sharing this article with us! Thanks for providing this list, I am familiar with all the mentioned blogs except johnchow blog, I have to check it out. 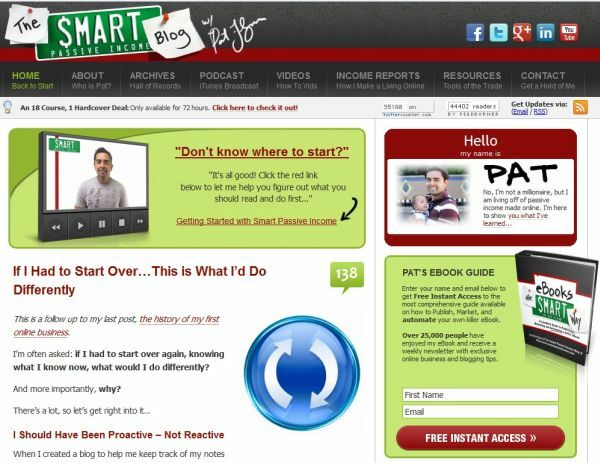 I really love Smart Passive Income by Pat Flynn, especially his podcast. Yaros blog is nice also, but I couldn’t get warm with John Chow. Also there are loads of less known blogs around these topics and some of them deliver great content! Anyway, thanks for the roundup.